Several hundred people marched through the streets of Philadelphia Monday night protesting a Missouri grand jury's decision not to indict Ferguson police officer Darren Wilson in the shooting death of unarmed teen Michael Brown. First assembling in Dilworth Park adjacent to City Hall, a few handfuls of demonstrators listened to St. Louis Prosecuting Attorney Bob McColloch announce the decision not to charge Wilson through megaphones held up to smartphone speakers. The news immediately angered the group, an audible gasp moving through the crowd, as the news became public. Shortly after, the protesters made their way into the streets and spent five hours letting their fellow citizens know they were not happy with the grand jury's decision. "No Justice. No Peace. No Racist Police." the protestors chanted as police officers, some on bikes, others on foot and more in cars and SUVs, followed them. Others yelled "Hands Up. Don't Shoot." as they held both arms in the air. The group grew larger as it made several loops through Center City, Chinatown, Rittenhouse, Queen Village and Penn's Landing. They were loud in speak, but remained peaceful in actions. "We continue to live in a racist America," a pastor said to the crowd on one of many stops during the march. "We come together tonight to become a new force in this country," the man went on. "There is strength in numbers. I cannot do it alone." 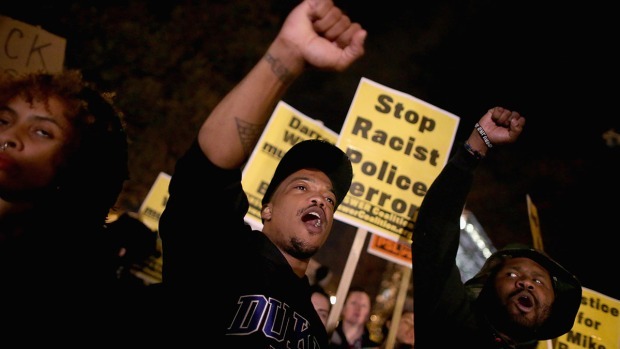 Tensions between the protesters and police did grow somewhat as the demonstrations wore on. Chants along South Street turned profane for a time as people shouted "f--- the police." When the crowd tried several times to enter Interstates 95 and 676 in Old City, officers were forced to hold a strong line on at least three highway on-ramps. The protests forced police to shut down parts of the highways as a result. One man was also taken into custody after he got into a traffic lane on I-95, police said. A bike officer eventually pulled him away. A second man was taken into custody after he tried to get on the highway, according to officials. By 1 a.m. Tuesday, the demonstrators made their way back to City Hall where they held a moment of silence for Brown and made an announcement to assemble again at 5 p.m. The demonstrators began assembling around 8 p.m. Monday, some four hours after dozens of Philadelphia Police officers staged in at least two areas of the city anticipating demonstrations following the decision. Wilson, a 28-year-old white man, shot 18-year-old black teen Brown on Aug. 9 following an altercation. Police later said Brown, who was unarmed, was a suspect in a strong arm robbery and that Wilson was acting in self-defense. The teen's death sparked violent riots in the St. Louis, Missouri, suburb and has reignited a national debate on race. Philadelphia Police spokesman Lt. John Stanford said safety of the public is paramount. A group of protesters who marched through Center City in reaction to the Ferguson grand jury verdict attempted to enter I-676 but were met by police. The group then held their hands in the air in honor of Michael Brown. 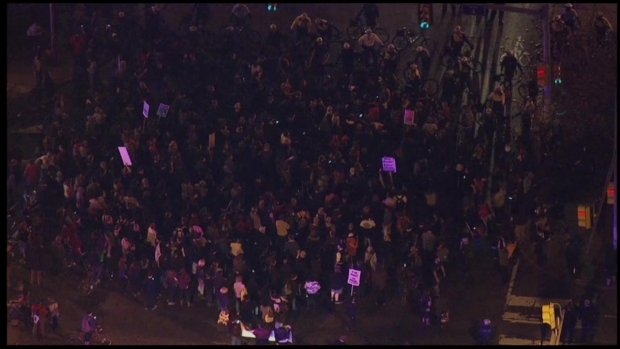 Take a look at video of the protest from SkyForce10. "The men and women of the Philadelphia Police Department will work to ensure that citizens can express their First Amendment right in a safe manner as well as protect property and minimize any disruption to the residents here in Philadelphia," he said.